When I dropped off to sleep this evening, the movie “Jane Eyre” was playing in the background—so it’s no surprise that the dreamscape is the English countryside. There’s a centuries-old barn, and my Galahad is stabled there. I am with him in his stall. I don’t see him, but he moves his shoulder nearer to me and I feel his breath on my face and hands as he breathes me in. Then I’m outside. I look up and see a vine hanging down. It’s got delicate, dark green leaves and tiny purple flowers—very beautiful. It’s just hanging from the sky, and as I follow it up with my eyes, it becomes clearer, and I can see that it goes up forever. I wonder if it will fall if I pull on it, but it doesn’t. Then I wonder if I can climb it—so I try, and the vine easily and naturally hugs my foot and leg to help me. I start to climb up, knowing I will be able to climb as high as I would like! Then I remember sweet Galahad and his warm physicality, and I hop down off the vine. Very strange—but lovely, warm., satisfying…. I am coming out, it seems, from “underground,” somewhere I’ve been with friends, perhaps a restaurant. I walk out into the edge of the woods along a road. My attention is caught by the early morning sun slanting through and illuminating the mist in shimmering patches rising from the ground. I move closer, spellbound. Each tiny hair on each fuzzy leaf is so clear, the drops of mist so sharp—I can see it all, feel it all. I am awestruck and I realize that I am one of the few who can see such things, or see that way. I look up and find myself at the base of a mighty tree—tall, so tall I can’t see the top, and huge. It is split into two huge trunks; lichens and other strange plants have taken root here and there. I can see it all with such clarity, and can feel the bark beneath my fingers. I look up and up, becoming more breathless and awestruck with each second. It occurs to me that I could climb that tree—all I have to do is scamper up it like a squirrel! I can actually feel my tiny claws gripping the bark as I go up a few feet, but I am afraid. Awe and yearning well up in me and I can’t move, only look and cry out to the Being I call Grandmother for help: “What does this mean?” I wake slowly, reluctant to let the vision go. These two dreams seem to mark stages in my understanding of my Soul’s path in this lifetime. The “Tree of Life” dream is the most powerful and numinous that I have ever had. At the time, it helped me to begin to realize both the fear-filled paralysis I was suffering as I tried to figure out what to do with my life after a layoff from my career as a research botanist. It also brought to my attention the gifts I have been granted, as one who can move relatively freely between the imaginal and the waking worlds. In the “Galahad and the Beanstalk” dream, the dream-I is curious about the beautiful celestial vine, and I begin to climb it without fear—I know that “I will be able to climb as far as I would like!” As in the first dream, though, I stop before going very far. But this time is very different: I stop not from fear but from love of my horse, and a deep knowledge that my path lies not in “heaven” (in my personal symbology, heaven represents the refined, spiritual, “mental” plane) but in the world, in connection with Nature and Horse. My path leads not upward toward Spirit and Samadhi, but downward and inward toward the deeper, embodied, feminine knowing of Soul. In the months since the “beanstalk” dream, I have become more certain of its message, and of the rightness of the direction it suggests. My soul craves not the denial of or escape from my embodied state, but the full embrace of embodiment, of deep connection with the Earth and all her creatures. This sense hints at a darker, moister, more “feminine” path; and yet it is not “passive and receptive,” as the Feminine is so often defined. But what might this mean? 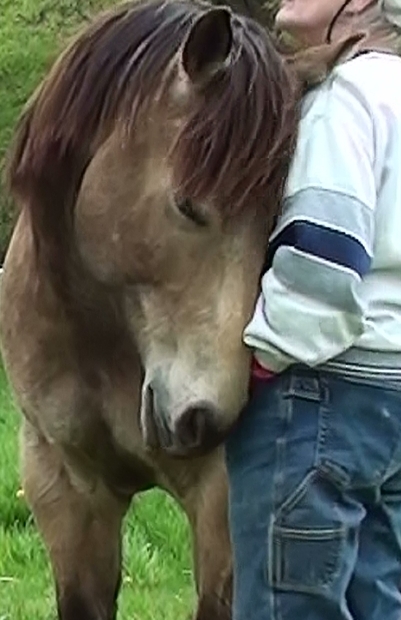 Exploration of the Feminine (in Jung’s sense) through interaction with my horses feels right to me: My interaction with them, and the community I’ve found since beginning my work with them, calls to the depths of my being. So even though I still can’t see more than a step or two ahead, I will trust and follow where my soul leads! Cross-posted on It’s an Alchemical Life.